rotating parts in drive systems like gears etc. 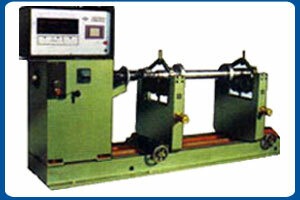 The starting of these machines is done manually by cutting resistances of starter in 4 to 5 steps. key-board facility provided on measuring panel for correct data feeding of rotor with 1 digit accuracy for itsdimensions like A, B, C, R1 & R2. Tolerance limits of both correction plans i.e. up, indicating no further correction necessary. For other details please refer 'Features of Measuring panel HDM-8500'.